A satin overbust corset with a metal busk fastening, steel bones and a laced back. There are 4 detachable suspender straps. The corset is trimmed with a ruffled machine lace at the top and bottom edges. A decorative ribbonslot style machine lace is stitched over the front bone channels. Black satin bows embellish the top and bottom edges. 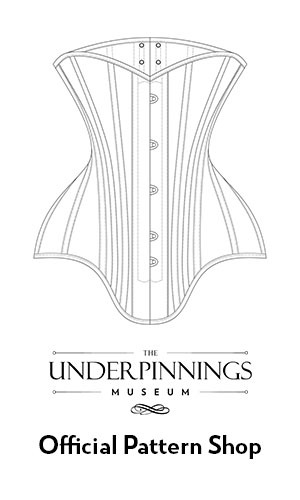 The corset has a relatively straight cut shape and was most likely intended as an occasionwear garment for the boudoir, rather than as shapewear. It’s similar in design to this corset, with a different lace trim and satin colour. This corset was likely made as a private label product for Agent Provocateur by another British corset manufacturer such as Axford’s (note the similarity in design to C111 corset style). In the early years of Agent Provocateur, many of the designs sold by the brand were relabelled products from other more established designers, such as Folies De Renauds. It was later in the decade that the brand’s explosive success allowed it to begin manufacturing its own exclusive designs. Agent Provocateur was founded as a luxury lingerie retailer and brand in 1994 by Serena Rees and Joseph Corré, with the first store opened on Berwick Street in Soho, London, UK. The brand became renowned for its provocative and daring designs and advertising strategies. The label often used celebrity models, and many early campaigns focused on women’s sexualities performed for their own pleasures, rather than the typical male gaze. The brand was sold to investment firm 3i in 2007. The company faced financial difficulties and entered financial administration in 2017, to be later sold to Four Holdings.